Late last month, Third District County Supervisor Chuck Washington, joined by firefighters and law enforcement, presided over the unveiling of Idyllwild’s newest piece of art at the Idyllwild Public Library located at 54401 Village Center Drive. The “Heroes Mural” pays tribute to firefighters, notably those who protected the Idyllwild community after a fire broke out in July along State Route 74. The Cranston Fire, as it was called, ultimately blackened more than 13,000 acres in the San Jacinto Mountains, burning homes and structures and forcing the evacuation of Idyllwild, Lake Hemet, Mountain Center and Pine Cove. The scars of the fire remain visible. 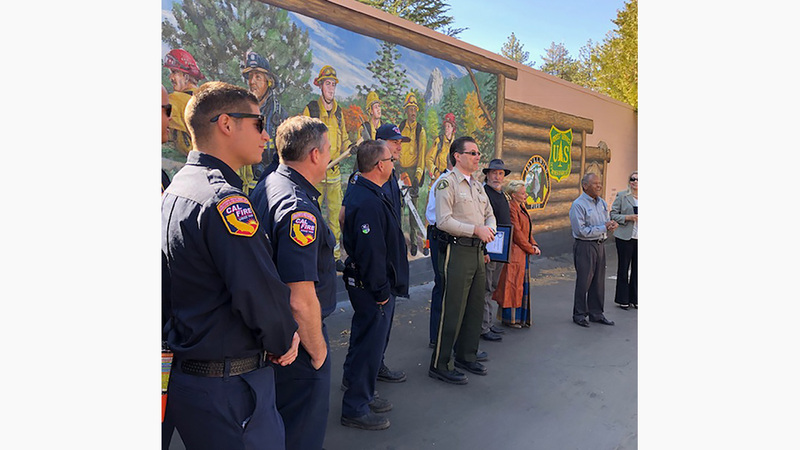 “The mural represents the hard work that both law enforcement and the firefighters do to keep the community safe,” said Supervisor Washington, who was joined by Idyllwild Fire Chief Patrick Reitz, Riverside County Sheriff’s Department Capt. Leonard Purvis of the Valle Vista station and members of CalFire. The mural rendered by artist Keith Blum, spans the back-exterior wall of the library. It depicts firefighters from multiple agencies, including the U.S. Forest Service, CalFire and Idyllwild Fire. Blum was originally inspired to paint a mural while attending an art show in Idyllwild. When the Cranston Fire broke out, Blum watched the fire and smoke from his home in Palm Springs. “I saw the smoke coming off the mountain, thick and dark, often blocking out the sun and dropping ash on us,” he said, adding that he was moved to donate his mural after seeing the “valiant efforts of the firefighters” to protect homes in Idyllwild. Blum spent a month painting the tribute with local businesses donating supplies, meals and lodging. He included a special thank you to his supporters in the mural.